I tried overnight oats a couple of years ago and I thought it was ok. I added a bunch a stuff to it and the next day I had the perfect grab and go breakfast meals. I recently tried to revisit making overnight oaks and I’m totally in love. What I’m doing this time around is putting the oats in the microwave for about a minute. I typically will add peanut butter on top of the chia seeds. ( because I really don’t like the texture of chia seeds. ) I currently do not add any vanilla, honey, cinnamon. I’ve tried adding those items in the past though. Place the oats and milk in a jar. Shake and refrigerate until the next morning. Add your favorite toppings, fruit, chia seeds, and enjoy! Enjoy the next morning. You can place you oats in another bowl to eat if you want to place it in the microwave or you can enjoy from the mason jar. I prefer to add my topping the day of. However, you can add your toppings when making it. Have you tried overnight oats before? I love it and I do make overnight oats sometimes. Yours looks delicious! That looms so fresh and yummy. Perfect for the season. Mmm, I need to try these! I always hear about overnight oats and they look delicious. This is a colourful meal.So,it is healthy and rich of all vitamins.I want to try it at home! I love an oaty breakfast. This is sounds so scrumptious and I love the fact that you can make it the night before, saving you time in the morning. This looks so delicious! I love the fresh fruit as well! 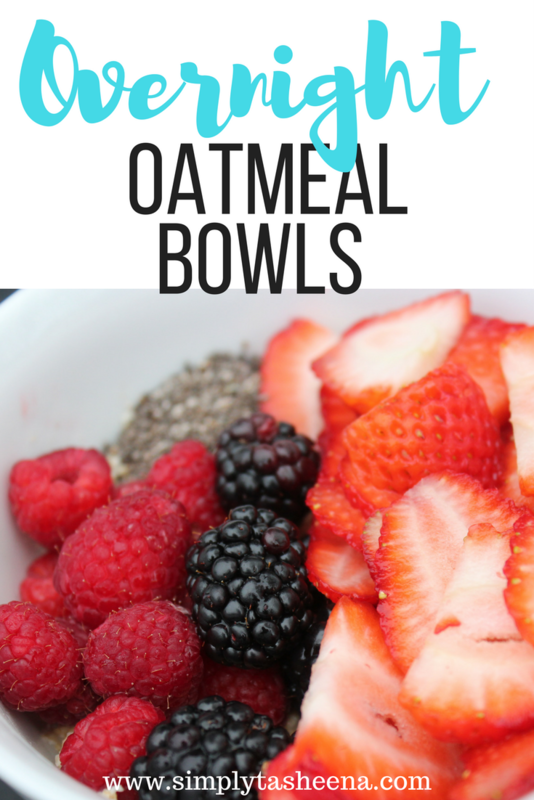 I never tried overnight oats before but will definitely be giving this recipe a try. It looks delicious!